A biological and environmentally safe cleaning liquid containing friendly bacteria and fast acting enzymes to breakdown, control and eliminate grey waste blockage. A biological and environmentally safe cleaning liquid containing friendly bacteria and fast acting enzymes to breakdown, control and eliminate grey waste blockage in waste water pipes. Ecoworks Marine Fogbuster is also a grey water additive (GWA) that can be added to waste water holding tanks to break down organic waste. A biological grey water additive that may be added to waste water tanks. 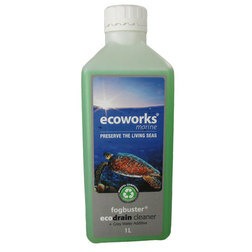 Creates a more pH neutral, safer and odour-free grey waste system. High concentration of natural bacteria break down organic waste quickly and effectively. Ready to use, dose directly into the drain line.